Mrs McGillicuddy has just witnessed a murder, only no one believes her. While on her way home from Christmas shopping, she sees a man straggling a woman on a passing train. She does her duty and reports it. However, no body is found and she's written off as some old nutter. Miss Marple knows her friend is not known to make up stories or see things. If she says someone was murdered, then someone was murdered. She works out where a person would drop a body from a train and decides the only logical place would be Rutherford Hall. Being an elderly lady, she realizes she needs strong bodies with intelligent minds to prove her theory. She enlists the help of Lucy Eyelesbarrow to find the body and Inspector Craddock to solve the crime. Lucy joins the staff of Rutherford Hall, wins the hearts of just about everyone, but she may be closer to the murderer than she realizes. 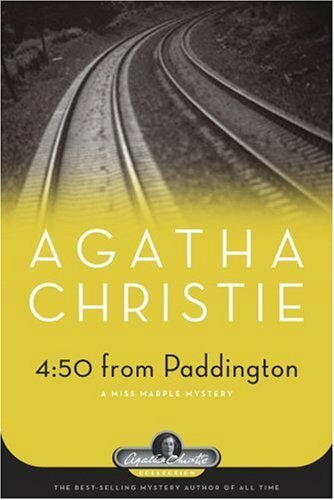 4:50 from Paddington is the third Miss Marple mystery I've read and I'm getting the impression that she doesn't do a lot of leg work in any of her stories. She's more of a consultant once she sets Lucy and Craddock on the case. I did enjoy the brainy Lucy though. She's a 'professional domestician, or an answer to a prayer' as she puts it. She's like Martha Stewart and Nanny McPhee rolled into a young, attractive package. She saw an opportunity to make a lot of money putting people's homes in order and does quite well for herself. Plus she's fearless (and way too good for any of the men who want to marry her!). 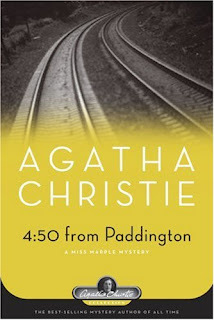 It's too bad that 4:50 from Paddington is the only Christie novel in which she appears. This isn't my favorite of the Agatha Christie novels I've read so far. I was a little disappointed at how things ended and who turned out to be the murderer. That doesn't mean I didn't enjoy it. Christie mysteries are always fun to try and solve. I think I read this a long time ago. But it had a different name then -- What Mrs. McGuillicuddy Saw. I prefer the Poirots to the Marples, myself, but almost any AC is a good escape. Nice honest review. It's been a long time since I read an Agatha Christie novel. I can't even recall, it's been so long. But I need to put it on my list just so I can be up to date on catalog of work. I have heard of the name Col Reads mentioned, What Mrs. McGuillicuddy Saw, that title sounds much more familiar. Yes, 4:50 from Paddington has another title. I think several of her books have different titles. The publishers must have thought they'd sell better. it makes it confusing for the reader though. I would like to read some Christie at some point. Maybe I will make her a project for 2012. I read my first Christie this summer and it was okay. I really need to give her work another try.